America has long been a nation of shoppers, and that is as true online as it is in the physical world. The earliest modern e-commerce transactions date to just 1994, but by 2015 Americans were spending nearly $350 billion annually online – or roughly 10% of all retail purchases, excluding automobiles and fuel. Pew Research Center surveys of digital commerce tell a similar tale. When the Center first asked about online shopping in a survey conducted in June 2000, just 22% of Americans indicated that they had ever made a purchase online. But in the intervening years that figure has increased nearly fourfold: Today, 79% of Americans say they make purchases online. And in an era of widespread social media use and smartphone access, many Americans are incorporating these devices and platforms into their purchasing behaviors. 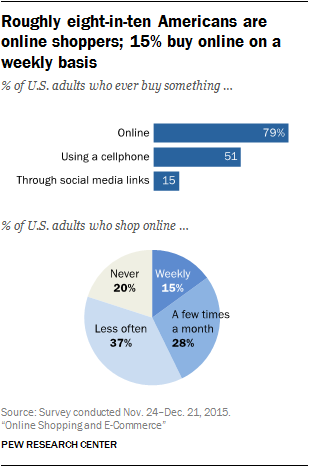 Roughly half (51%) of Americans report making online purchases using their cellphones, while 15% have purchased something by following a link on social media sites such as Facebook or Twitter. A substantial majority of Americans are online shoppers, but for most this behavior is a relatively infrequent occurrence. Some 15% of Americans say that they make purchases online on a weekly basis (4% do so several times a week, while 10% do so about once a week) and 28% shop online a few times a month. On the other hand, nearly six-in-ten Americans say they buy online less often than a few times a month (37%) or they never make any online purchases (20%). And while each of these online shopping behaviors are relatively common across a wide range of demographic groups, younger adults in particular are especially likely to utilize cellphones and social media platforms to engage in commercial activity. Some 90% of 18- to 29-year-olds ever buy items online, while 77% have purchased something using their cellphones and 24% have bought something by following a link on social media. 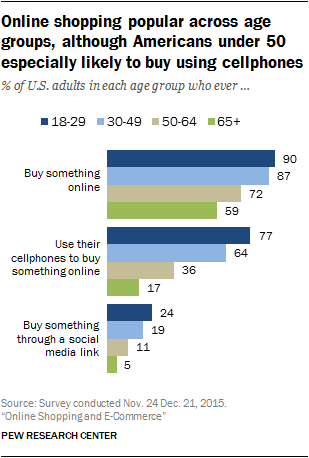 By contrast, a majority (59%) of those 65 and older ever generally make online purchases–but only 17% have bought something using their cellphones and just 5% have done so through a social media link. Despite the large share of Americans who engage in online shopping and the potential conveniences that come with buying online, a majority of online shoppers indicate that – all things being equal – they actually prefer to do their shopping in physical stores. Some 65% of online shoppers indicate that, when given the choice, they generally prefer to buy from physical locations; 34% indicate that they generally prefer to buy online. As might be expected, the most dedicated online shoppers tend to express a relatively pronounced preference for shopping online as opposed to shopping in physical stores. Among Americans who make online purchases on a weekly basis, 62% indicate that they generally prefer to buy online, while 37% generally prefer to buy from physical stores. But among those who buy online on a monthly basis, 42% prefer online shopping while 58% prefer buying from physical locations. And among those who make online purchases even less frequently, just 18% prefer buying online – with 82% indicating that they prefer to shop in physical stores. But even as many online shoppers express preferences for physical stores in the abstract, their ultimate decision of where to buy something often comes down to price. 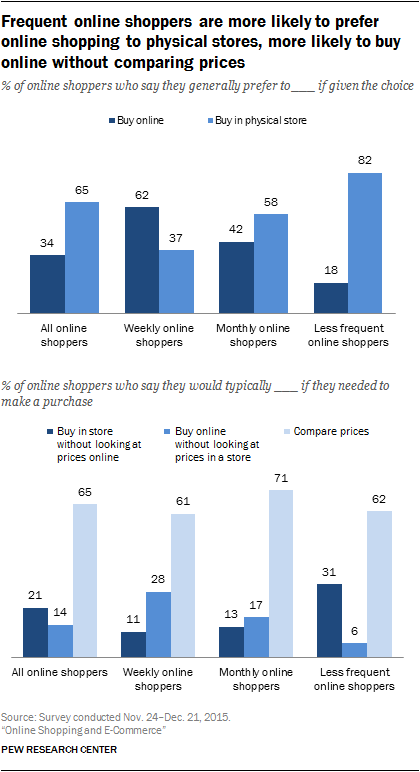 When asked a second question about their relative preferences for online and in-person shopping that incorporates pricing, fully 65% of online shoppers indicate that if they needed to make a purchase they would probably compare the price they could get online with the price they could get from physical stores and choose whichever one offered them the best deal. Another 21% of online shoppers say they would likely buy from stores without looking at prices online, while 14% indicate they would buy online without looking at prices in physical stores. Users who frequently shop online are substantially more likely to say that they would typically choose to make purchases by simply buying online without visiting stores: 28% of weekly online shoppers say that they would likely do this if they needed to buy something, compared with 17% of monthly online shoppers and just 6% of those who buy online less often. But even among these frequent online shoppers, 62% say that they would typically compare the price they could get online and the price they could get in physical stores and choose whichever one is cheapest. Americans take a number of factors into consideration when shopping for something that they haven’t purchased in the past – especially the ability to compare prices from multiple sellers and to ask questions about what they are buying. When asked about the importance of seven different factors when buying something for the first time, 86% of Americans say that the ability to compare prices from several different sellers is either extremely (42%) or somewhat (44%) important, while a similar share say that being able to ask questions is extremely (42%) or somewhat (41%) important. 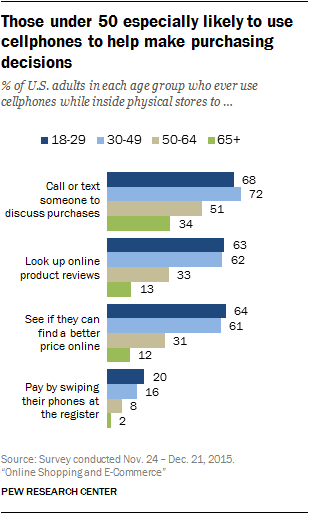 Other factors that Americans consider important include the ability to buy from stores or sellers they are familiar with (34% of Americans describe this as extremely important); the ability to read ratings or reviews that other people have posted online (32%); the ability to look at or try out the product in person (30%); and the ability to get advice or recommendations from people they know (23%). 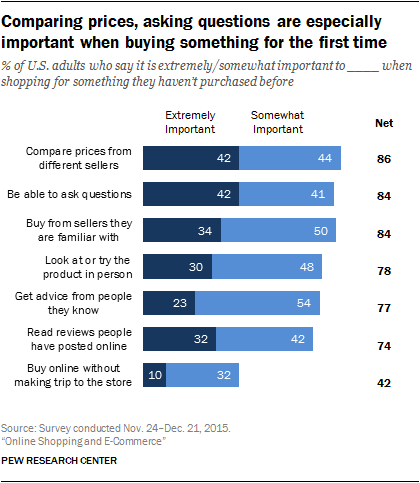 The ability to buy online – without having to make a trip to the store – ranks as the least important factor: just 42% of Americans say that this is at least somewhat important to them when buying something for the first time, and only 10% describe it as extremely important. Regardless of their demographic characteristics, when buying something for the first time most Americans assign greater importance to being able to look at or try the product in person than they do to being able to buy online without making a trip to the store. However, frequent online shoppers are one of the few groups who place more importance on being able to buy online. Nearly three-quarters (72%) of weekly online shoppers say that being able to buy online without having to make a trip to the store is important to them when buying something for the first time (20% say it is extremely important). Meanwhile, a slightly smaller share (66%) says it is important to be able to try something out in person (with 15% saying this is extremely important). Today cellphone ownership is nearly ubiquitous, and roughly two-thirds of Americans have smartphones. And as the reach of these mobile devices have expanded, many consumers are using them to augment and assist with their physical and in-person purchasing experiences. 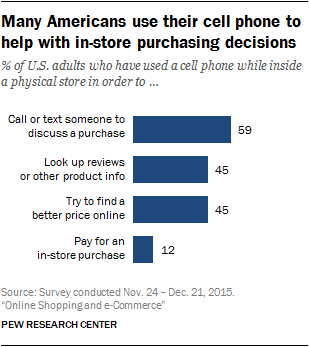 The survey asked about four different ways that people might utilize their mobile phones while making purchasing decisions inside physical stores and found that calls for advice and assistance are especially common: Nearly six-in-ten Americans (59%) say that they have used their cellphones to call or text someone while inside a store to discuss purchases they are thinking of making. Just under half (45%) have used their phones while inside a store to look up online reviews or to try and find a better price online for something they are thinking of purchasing. And a relatively small share of Americans (12%) have used their cellphones to physically pay for in-store purchases. As noted above, a majority of Americans under the age of 50 have used cellphones to purchase something online – and this group is also especially likely to utilize their cellphones while making in-store purchasing decisions. Fully 70% of 18- to 49-year-olds have used their cellphones to call or text someone from inside a store to ask for purchasing advice, while 62% have used their phones to look up online reviews of something they were thinking of purchasing or to see if they could find a better price online. And nearly one-in-five (18%) have swiped their phones at the register to pay for purchases.